As as coach builder, Clenet Coachworks Inc. manufactured limited-edition luxury automobiles in Santa Barbara County, California, between 1975 and 1987. The Clenet attracted a diverse but loyal following among entertainers, celebrities, diplomats, and wealthy entrepreneurs, both in the United States and abroad. Every Clenet featured a timeless 1930s appearance combined with the most modern running gear, electronics, and luxury amenities at that time. These cars were seen on numerous television shows and movies, including "Dallas", "Dynasty", and "Dragnet". Clenet Coachworks Inc. was formed by Alain Clenet and investors in 1975. Alfred J. DiMora was one of the early employees of Clenet Coachworks Inc. in 1976. After the company ceased production and went bankrupt in the early 1980s, DiMora formed the Classic Clenet Club in 1982 as an organization to support Clenet owners with parts, service, technical advice, and social gatherings. He later revived Clenet production by purchasing the assets of Clenet Coachworks Inc. and creating a new factory in Carpinteria, California, where he designed and manufactured Clenets. In the spirit of continuing to support Clenet owners and enthusiasts, DiMora has now created this website to serve as the trusted source for Clenet technical information, parts, service, photos, articles, video clips, and social events. As this website develops and grows, you will find a tremendous amount of factory history, to include who bought Clenets, who owns them today, how-to manuals and videos, and where to purchase a Clenet. 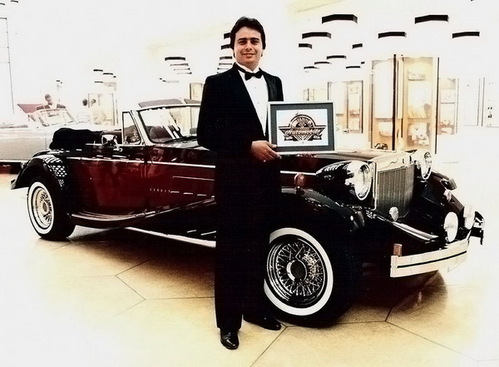 The Classic Clenet Club is committed to keeping these timeless automobiles on the road, providing restoration services, authentic factory documentation and blueprints, and much, much more. Membership in the Classic Clenet Club is free. You do not have to own a Clenet to become a member. You will receive our newsletters and related information at no charge. By contacting us, you will be able to share your ownership experiences with others and publish them on this website. We will also invite you to Clenet get-togethers that you are sure to enjoy. If you have any Clenet, whether a Series I Roadster, a Series II Cabriolet, a Series III Asha, or a Series IV Sportster, please support your fellow Clenet owners by completing the registry form and sending us any information and pictures you would like to share concerning Clenets.